Barnes & Noble will bring a new Nook to the e-reader wars later this month, according to a filing with the U.S. Securities and Exchange Commission. The filing says Barnes & Noble expects to announce its new e-reader on May 24. Dow Jones reported the news, but could extract no further information from Barnes & Noble. The report speculates that Barnes & Noble will release "a more powerful combination tablet and e-reader" running Google's Android 3.0 Honeycomb operating system. I'm skeptical, given that Barnes & Noble already sells the Nook Color, and recently updated the software to include an app store and e-mail. CNet speculates that Barnes & Noble will simply upgrade its E-Ink Nook, which launched in 2009. The hardware hasn't seen a single upgrade since then, while Amazon's competing Kindle has grown lighter and thinner. A straightforward hardware refresh is long overdue. But there is a third possibility: What if Barnes & Noble is changing course with its e-reader and doing something a more complicated than a Nook hardware upgrade? Mike Cane has done some patent and trademark digging and guesses that the next Nook will have a touch screen, using E-Ink's Pearl display technology. This would allow Barnes & Noble to do away with the secondary color touch display on the current Nooks. The resulting product would be more like Sony's Reader Pocket Edition. 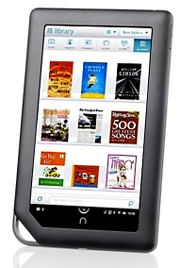 Whatever Barnes & Noble announces, it will arrive amidst a flurry of Amazon tablet rumors. The e-reader wars are getting exciting again.